kt literary » Blog Archive » Day Two! I’ve got another goodie today. In the spirit of the season (although hoping for no weather-related travel disruptions), I’m delighted to offer a signed by Maureen Johnson copy of the latest edition of Let It Snow! Plus, as a bonus — whatever menu/matchbook/souvenir-type item I can steal out of our nearby Waffle House. Oh yeah. If I could figure out a way to bundle this with a teacup pig and a blizzard, I would do so. Leave a comment below to enter! From the book’s description: Sparkling white snowdrifts, beautiful presents wrapped in ribbons, and multicolored lights glittering in the night through the falling snow. A Christmas Eve snowstorm transforms one small town into a romantic haven, the kind you see only in movies. Well, kinda. After all, a cold and wet hike from a stranded train through the middle of nowhere would not normally end with a delicious kiss from a charming stranger. And no one would think that a trip to the Waffle House through four feet of snow would lead to love with an old friend. Or that the way back to true love begins with a painfully early morning shift at Starbucks. Thanks to three of today’s bestselling teen authors–John Green, Maureen Johnson, and Lauren Myracle–the magic of the holidays shines on these hilarious and charming interconnected tales of love, romance, and breathtaking kisses. ← A Second Star for RED BUTTERFLY! Hi – I would love to read this! I’m ready to get into the holiday spirit! Congrats, Lauren! You won! 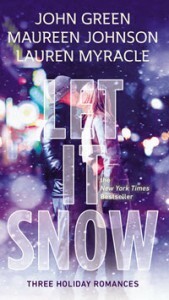 Email me at daphne.unfeasible@gmail.com, and I’ll get your signed copy of LET IT SNOW out asap! Yes please! I read and loved this when it first came out, but I’m always eager for a re-read of something this fun. Can’t wait for the movie, too! It’s exactly what I have been wanting for Christmas! Would absolutely love to have it! Ooh, I want this one too! Big fan of Maureen, haven’t got this one yet! Ooh, this is such a good one! Oh, I’d love to read this one! It’s always checked out at the library, which means it must be amazing! Ahhhh! Another winter book with three authors I adore. These giveaways are amazing!! I’m going to look for this one! Love these authors! Would love the book, but will pass on the Waffle House souvenir. Brings back memories of being stranded there during a hurricane in Nashville – when I was supposed to be in Atlanta! I’m halfway through and loving this book…! Maureen Johnson nailed that first story! I remember Maureen Johnson Tweeting about Let It Snow. Sounds great! I blame this book for getting me hooked on Christmas stories. As much as I love John and Maureen, I really have to read this book. Maureen Johnson is awesome. And this edition looks superb. I love Maureen! But I mean who doesn’t? I have officially dedicated a shelf for all her books and her if she’s willing to sit on it. Thanks for the amazing giveaway! Loved this book so much ?